For these rings I curated some top natural turquoise pieces, and each ring has the mine name stamped inside the band for authenticity. Mines include Fox, Blue Moon, Candelaria, Skyline...all high grade succulent pieces. I cannot express the level of excitement I've been feeling since Free People reached out to me. It's because of you reading this, and everyone who has supported me on this path that this could even become a reality instead of some distant dream. It hasn't been an easy road trying to do what I love full time and make it work. Being the creator and sole runner of a business has it's downsides, but the reward of not just doing what I love but being able to share it with those who also enjoy it is worth everything. Thank you all for stickin' with me, giving me support and exposure, and taking a peak into my world of myth, stone, and metals. These new jewels will be added to the shop tonight! A shop I have stocked with for years gave me back some old consignment pieces in exchange for finished wholesale pieces...so you get the first pick! Some of these goodies are 1-3 years old! Others are brand spankin' new. Pieces are in the works. Commissions are orders are in the works. News is in the works. Well, once again it's been quite awhile since my last post here. I wanted to update folks about an exciting opportunity to acquire not just my jewels but work by local artists from Portland, Maine, where I now live! For those of you that follow me closely you know I have a studio space at The Dooryard Collective. I'm the only jeweler, and others work in mixed media, paint, printmaking, stencil art, installation, and bronze sculpture. I love being among these talented people, and two of them have recently created CSArt, Portland's first art share program. By purchasing full shares or half shares you can invest in several *surprise* art pieces by different Portland artists for the price of one of my larger pieces of jewelry. Many of these artists are from The Dooryard. The cost is an amazing deal for what you receive, and it's also a great starter package idea for anyone with bare walls calling to be covered. In honor of the melt worthy heat outside, take 13% off in the main Stray Arrow shop with all orders over $25 (does not apply to custom orders). A few new items will be hitting the shop throughout Sunday, made again in between filling orders. Long term custom orders are almost all complete so more pieces will be filtering in soon! In the main shop enter in coupon code: FIREWORKS, for 10% off of your order. Check back to the shop tomorrow for these sweet and simple new pieces! A few new items will be hitting the shop this morning that I've created in between filling orders and custom pieces. Here's a short preview...more news soon! These new pieces will be hitting the shop throughout the day and this evening! Things have been a bit slow in the studio for various reasons. Now that the icy shores I've recently planted myself on are starting to show signs of life again, so will the shops! I'll be finishing up commissions (don't I always say that? ), and creating more items for BOTH shops. YES, that means plugs too! ^Old Grounds earrings, a made to order offering of dark silver, pyrite fool's gold, and deer hide straight from my annual powwow. ^WEAVER rings, all featuring a ring band with a textile/weaved patterning. ^new Cave Stack set with Fox mine turquoise. Size 7.5. ^Bangle bracelet with copper, bronze, molten silver, and natural Kingman mine turquoise. ^size 9 Royston ribbon turquoise stacker in blackened silver. ^size 6.75 Blue Gem turquoise in gold fill and blackened silver. ^size 7.5 iolite gemstone Arrowvane ring with band detailing. * Spheres and Tides ring, featuring Castle Dome and Manassa turquoise, will fit sizes 6.5-7. ^size 8 rustic ruby in zoisite stacker. ^size 6.5 Royston Ribbon turquoise with cut out bezel detailing and extra stacker. ^size 7.5 Kingman blue turquoise and dark silver stacker. ^size 7.5 CAVE STACK, featuring old stock Number 8 mine turquoise in gold fill, and dark silver. ^necklace with Blue Boy variscite, gold fill, and dark silver. 20" chain. ^White Buffalo Arrowvane earrings, 1.5" tall in total. That's it folks! Check back in the shop and be sure to use the COUPON CODE for 15% off of your orders over $25! To give a brief summary, I'm sharing my experience and rock haul from the Tucson Gem Show this year. Anything marked N/A in the photo is not available for custom orders. All other stones are up for grabs and will ONLY be fully reserved once you nail a design down with me and a deposit for said design has been paid. Please be aware that unless you've sealed a piece with me, I may be showing the same stones to others. I swear these are the weirdest, coolest things. I got so many, "Uhm how many photos of cacti is this girl going to take???" stares. I don't even care. Keep a look out as I'll be posting NEW ITEMS to preview here on the blog this coming Sunday before they hit the shops! In the meantime, if you aren't in a sunny land, stay warm and bundle up! Well folks, it's the first of the month. I think it's time to bring back the Rock Appreciation Days, what about you? Today VARISCITE will be highlighted. See the feature and photo examples of current and past jewelry pieces using variscite at the END of this post. For now, I'd like to update you all. Studio access has been slightly limited in the recent past due to construction on the building. A big thank you to all who have placed orders for your immense patience during this time! The studio is now at full speed again and any work in my space has finished. Due to the slower production speed I have solely been keeping up with "made to order" items and custom items. I will finally be updating the main Etsy shop with new items next week. To stay posted on exactly when you can follow any of my social media seen at the right side bar. I will be going to the Tucson Gem Show! This is a big deal for me, because it is absolutely huge and spanning a month's time, and I wasn't able to go last year. I will be gone from February 9-13th. Please note that I will keep both Etsy shops open during this time, but some "made to order' items may be deactivated. All orders will ship upon my return. As I am shopping for rocks, I'm giving you all an opportunity to weigh in. What kinds of stones would you like me to use more? Have a custom piece in mind with a specific kind of stone you want me to hunt for? If you have a serious hankering, please list your desires in the comment section below. I'll be adding it to my 'treasure hunt' list. When I return all new scores will be photographed and posted here. For the most up to date Gem Show experience you can follow my Instagram: @thestrayarrow. This giveaway will primarily be for Instagram. Any comments below on THIS post will also be included into the giveaway! Comment with stone opinions! Win the Feathered Band with Arrow Vane below, in your size. Winner will be chosen Feb. 14th. then yes. There's no respect being shown, and my hard work is being stolen. Unfortunately there is little to be done, and speaking with people who clearly have no respect for others OR respect for themselves is most often a dead end. Again. This is a message for you to be aware. Not to dictate whom you should be buying from. When folks purchase my work along with that of my peers I get excited customers enjoy our work all around. There are wonderful, talented, respectful artists out there with some true integrity. They spend years creating work that evolves into a personal aesthetic. I will always fight for my creative rights and the rights of my peers. Please be respectful of the creative rights of other artists. Please be aware of what you're looking at and who you are supporting. Lastly, please take this message as a celebration of those who know themselves and stay true. Variscite is an aluminum phosphate mineral, ranking about a 3.5-4.5 on the MOH's hardness scale. It is often confused with turquoise, although more often than not much greener. It is another popular southwestern stone for jewelry use. The most popular can be found in Lucin and Fairfield, Utah, and Esmeralda and Lander counties in Nevada. It also hails from Australia, Brazil, Spain, Poland and Germany. Many kinds of variscite, especially from the USA, can have host rock webbing in them again making it easy to confuse with turquoise. No. This isn't a post about rocks. Things are now settled, it's time to share the new place and new jewels! ^Russian music boxes that each play a different theme from "Fiddler on The Roof", antique mirror with Stray Arrow Featherblade necklace, and my favourite designated CAVE LADY plaque. The music boxes represent an old memory from one of my grandmothers. The plaque was made for me by the dear Tory of ToryNova, featuring me in true Cave fashion on the left, and her in true T-REX fashion on the right. ^ My gargoyle Askewheteau ("He who keeps watch"). Dangling from him is one of the first finished necklaces I made 4-5 years ago. The necklace was an "East meets West" theme featuring a Southwestern Thunderbird and the three clans from the Kanienkehaka (turtle, wolf, bear). Dangling stones are white buffalo turquoise and Crow Springs mine turquoise. That's it folks! Thanks for keeping up and supporting my work. As always, there's more to come! 25% off orders over $100 with code: KEEPINGUP, ends at midnight! While I've been busy in the studio there's been a slightly diminished online presence. I'm still banging away on jewelry as ever. Custom orders have been churning out steadily and my silly slow move has been coming along. Soon the new place will be fully set up with a new organizing system for jewels and stones. I'm excited to share photos upon completion! In the meantime, please don't forget that the October SALE ends next Friday! See the shop for details about the sale. FIND THE FOUR LEAF CLOVER! First person to properly locate it will win, and I'll message them the coupon code. Firstly, a brief photo viewing of the pieces that'll be listed today, Sunday. Then some photos of the outdoor ventures in this lovely New England Autumn weather. 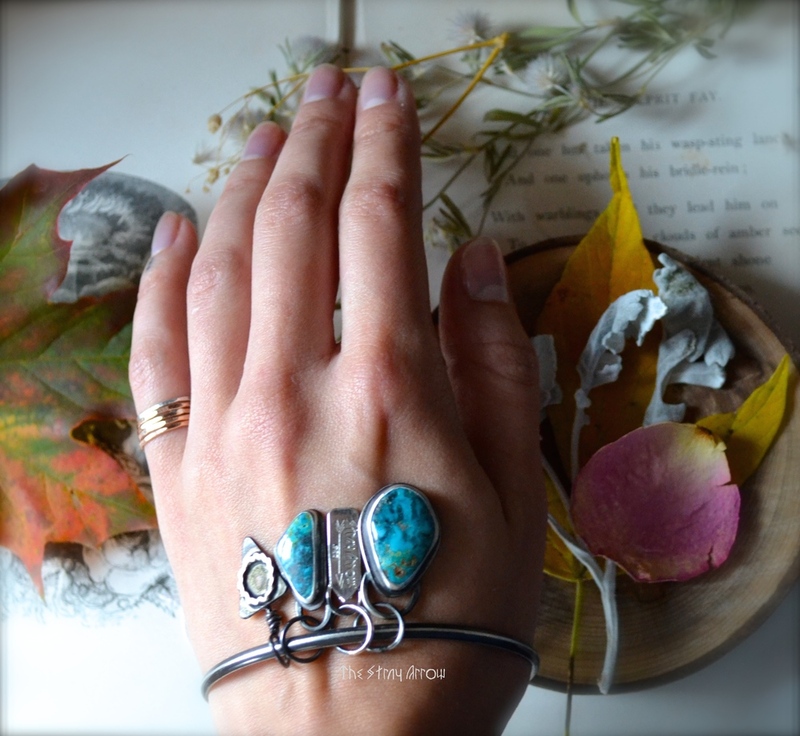 Lastly, some very important news concerning the month of October for my shop and all jewels. There may be a few 2-4 day spans when they're on "Vacation", but on the whole they'll be open. Many of the "made to order" items will be deactivated. Mostly "ready to ship" pieces will be available. If you're looking for something you were hankering for and no longer see it listed, convo me either on Etsy or email me here: Stasia@thestrayarrowjewelry.com. I may have studio time available to whip it up. If something is listed, it means I CAN make it. Production time will extend on all orders to 2-3 weeks. If I have started conversing with you about a commission, don't worry. I still have a studio to work in and we can create something lovely for you in a timely manner. I will NOT be taking custom orders during the month of October UNLESS it is a very desired and needed gift for someone (I've got a soft spot). If you do have an idea for a custom order you're serious about, contact me to plan for it come November/December. I hope you're all enjoying the season! These couple of new rings will be hitting the shop today, ranging from size 6-7. Check back to the blog late this afternoon or tomorrow to see the AMAZING new haul of gemstones and stones I got at the rock show yesterday!